I seek to reconfigure familiar notion of space in such a way that the viewer is drawn in to questioning his or her experience of it. This video installation is a kind of slide show of short movie clips, which consists of two side by side projections slowly fading in and out simultaneously. 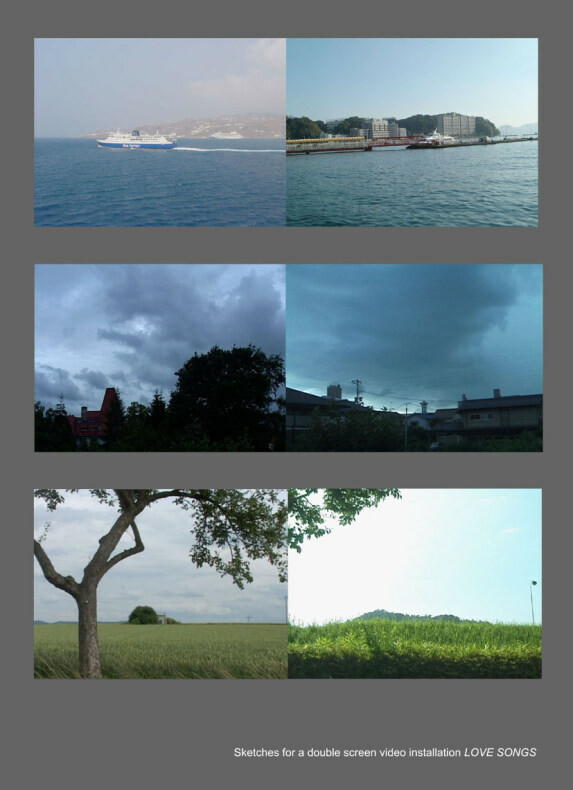 Half of the screen shows a scene in Japan and the other half shows one in Germany, and they create a landscape that looks continuous owing to the integrated compositions and events: rain starts at the same time, a river flows across the border, and so on. The theme is distance and communication. How can we bridge over physical and psychological distance? Can our imagination overcome physical limitations? What kind of communication would be possible between people who live in different worlds that have different environments, social systems, and cultures? How can we create space for negotiation in between conflicting value systems? This work is a process of searching answer for these questions.